The M 5 set constructed by Zellweger and very similar to the P 5 patrol set has been in use onboard vehicles (M 5 / SE-112), it could be powered from batteries, a hand cranked generator or in most cases from a rotary converter. The M 5 set consists of a transceiver case (identical to the one of a P 5) with a battery compartment (weight 15,4 kg, with the battery 19 kg), a generator case (another 15,4 kg) with the hand cranked generator and spares and a rotary converter unit. 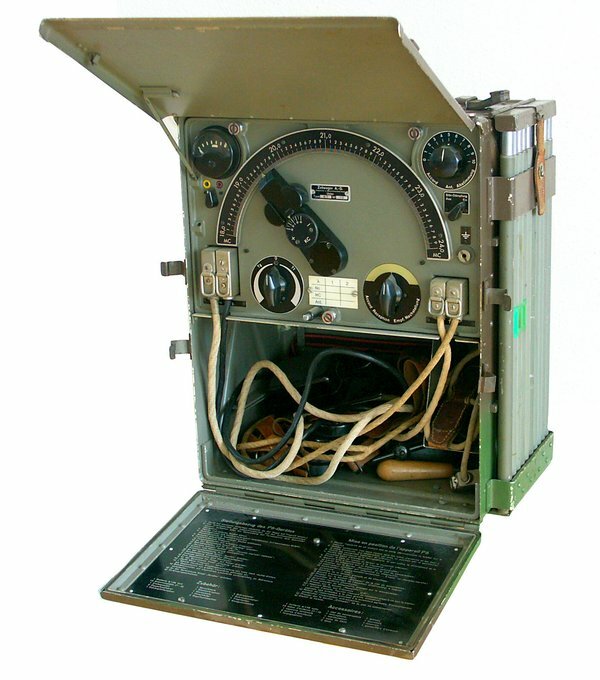 In the transceiver case, the transmitter section is located at the right and the receiver section at the left side. The receiver can be powered from a combined LT (1,5V)/ HT (126V) battery or a hand cranked generator; for transmitting, the hand cranked generator or a rotary converter for onboard use on vehicles must be used under all circumstances. The set switches automatically from receive to transmit mode when You press the push-to-talk button or when You operate the morse key, one second after transmitting the last morse code letter, the SE-112 returns to receive operation. The operation of the M 5 is uncomplicated: The huge frequency dial pointer also acts as tuning knob, it does directly operate the main tuning capacitor of the transmitter and receiver sections. Press the two pushbuttons at both sides of the dial pointer to move it, it will lock in 20 kHz steps mechanically. A round thumbwheel lets You detune the set for +/- 50 kHz, to move the dial pointer to another position, set the interpolation tuning knob to zero again. A rotary control "Empfangsnachstellung" permits to shift the receiver's operation frequency +/- 50 - 100 kHz. As found in other Zellweger sets, the main switch has it's zero / off position in the middle, turn it to the left for telegraphy mode and to the right for telephony mode, the control also acts as volume control. Use the antenna tuning control to adjust for a maximum reading on the antenna current instrument when the transmit switch is activated; the meter can be switched to indicate the heaters and anode / B+ voltages, too. The accessories can be stored in a compartment just below the transceiver chassis: the combined LT / HT battery, the headphones, the hand and the throat microphone and the morse key. With the switch on the microphone on the "on" position, the valves of the transmitter stages are heated continuously, in the "off" position they are switched off and the M 5 / SE-112 is in "receive" mode only, when You press the push-to-talk button, You have to wait four seconds until You can start speaking. The hand cranked generator is integrated in a case very similar to the transceiver case: a voltmeter indicates, when the necessary voltages for operation are okay or if You have to crank with higher speed to generate the heaters / LT voltage of 5,7 V ond the anode / HT voltage of 120 Volts. A rotary switch allows You to reduce anode / B+ voltage from 180 to 90 Volts, the transmitter output power will be reduced to 1 W and You will find turning the crank of the generator a bit easier. The rotary converter comes in a metal case and is operated from 12V DC from the car battery, ot's output voltage is 180 Volts. The converter starts operation automatically when the M 5 / SE-112 is switched on. The set's operation range is 15 km in telephony and 20 km in telegraphy mode under standard conditions and up to 180 or 200 km from a well suited location on top of a hill.